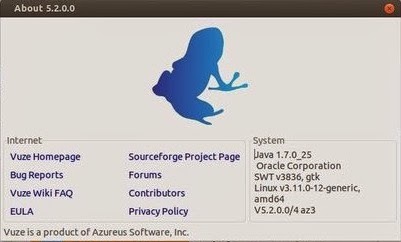 How to : Install Vuze (Azureus) 5.2.0 - A BitTorrent Client on Your Ubuntu/Linux Mint Systems ~ Your Own Linux..! Vuze (previously Azureus) is a BitTorrent client, written in Java, that uses BitTorrent protocol to transfer file making the use of the Azureus Engine. Besides downloading the information associated with .torrent files, Azureus lets the users to share, view and publish genuine video content of DVD and HD quality. Vuze has reached to it's latest version Vuze 5.2.0 and this article is intended to help you installing Vuze 5.2.0 in your Ubuntu/Linux Mint systems. What's New in Vuze 5.2.0? Several improvements have been made to the torrent file experience overall. users can also choose which file type to download, such as .avi, .mp4 and others. The torrent client software now has a menu option in the notification area to dismiss all notifications. Brazilian Portuguese, Basque and Spanish language updates have been implemented. You can also download .deb package from this source and install it. I cant't find in the menu "view" the tool "sidebar"